EASY TROUBLESHOOTING OPTIONS: CORRECT THE ENVIRONMENTAL DEFICIENCIES . If the pH or the temperature is off, adjust them. If there are missing nutrients, add them. If there is chlorine in the water, remove it or use a different water source. CORRECT THE MICROBIOLOGICAL INFECTIONS . To solve the immediate problem, you can either use your pot still to pasteurize the wash or you can treat it with antibiotics. Once the wash is aseptic, pitch your yeast and measure the results. Long term you will want to find the source of the microbiological infections, which may require changing suppliers and/or introducing better cleaning procedures. 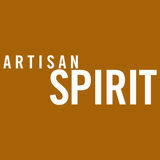 Discover the true ﬂavor of coconut, hazelnut, cocoa, orange and lemon through Craftsman's Finest cream liqueurs. Our B2B product line made with natural and pure ingredients, developed to be blended with each other seamlessly. STOICHIOMETRY IS THE MEASURING STICK FOR YEAST HAPPINESS Comparing your alcohol yield to the one that should be obtained under ideal conditions (the stoichiometric yield) is a good way for you to gauge how far your conditions are from ideal. 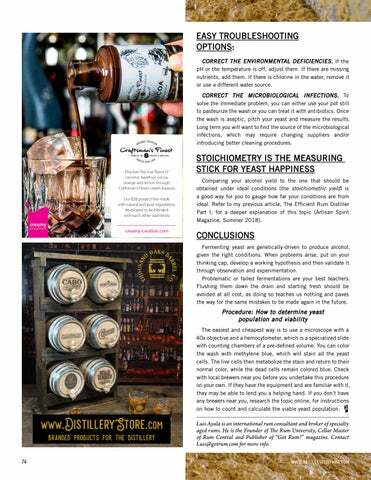 Refer to my previous article, The Efficient Rum Distiller Part I, for a deeper explanation of this topic (Artisan Spirit Magazine, Summer 2018). CONCLUSIONS Fermenting yeast are genetically-driven to produce alcohol, given the right conditions. When problems arise, put on your thinking cap, develop a working hypothesis and then validate it through observation and experimentation. Problematic or failed fermentations are your best teachers. Flushing them down the drain and starting fresh should be avoided at all cost, as doing so teaches us nothing and paves the way for the same mistakes to be made again in the future. Procedure: How to determine yeast population and viability The easiest and cheapest way is to use a microscope with a 40x objective and a hemocytometer, which is a specialized slide with counting chambers of a pre-defined volume. You can color the wash with methylene blue, which will stain all the yeast cells. The live cells then metabolize the stain and return to their normal color, while the dead cells remain colored blue. Check with local brewers near you before you undertake this procedure on your own. If they have the equipment and are familiar with it, they may be able to lend you a helping hand. If you don’t have any brewers near you, research the topic online, for instructions on how to count and calculate the viable yeast population.